The Masculine Heart: Rick Hanson - What Are They Feeling? Tune into others. Rick Hanson - What Are They Feeling? Tune into others. Some good heart wisdom for getting back online this evening - apologies for the two-day absence. Google's Blogger platform was down since yesterday morning, so I have not been able to post at all. Rather than be angry about it, I'm going to tune in to Rick Hanson's wisdom teaching in this edition of his Just One Thing newsletter. I'm going to imagine how it must feel when the software millions of people depend on for their blogs (and some people's livelihood depends on their blogs) goes belly up for an extended period of time. This is the longest outage I can recall in the 8 or so years I have been online in various incarnations. When I tune into that, I feel anxiety and frustration, and maybe some fear that heads will roll for this. My sense is that they were more relieved than I was when they got it back online. This blog comes from Rick Hanson, Ph.D., neuropsychologist, author, founder of the Wellspring Institute for Neuroscience and Contemplative Wisdom, and meditation teacher. See Rick's workshops and lectures for therapists and the general public. Rick is author of the best-selling book Buddha's Brain: The Practical Neuroscience of Happiness, Love, and Wisdom. That’s a world without empathy. To me, it sounds like a horror film. Without empathy, there can be no real love, compassion, kindness, or friendship. Empathic breakdowns shake the foundation of a relationship; just recall a time you felt misunderstood – or even worse, a time when the other person could care less about understanding you. In particular, anyone who is vulnerable (e.g., children, the elderly) has a profound need for empathy, and when it’s a thin soup or missing altogether, that’s very disturbing. In my experience as a therapist, poor empathy is the core problem in most troubled couples or families; without it, nothing good is likely to happen; with it, even the toughest issues can be resolved. Empathy gives you a feeling for what it’s like to be another person. When you are empathic, even quietly and tacitly, that tells the other person that he or she exists for you as a being, as a Thou to your I. That’s usually what people most want to know; it’s more fundamental than whatever topic is on the table. Empathy is soothing, calming, bridge-building; when it’s present, it’s much easier to work through things. 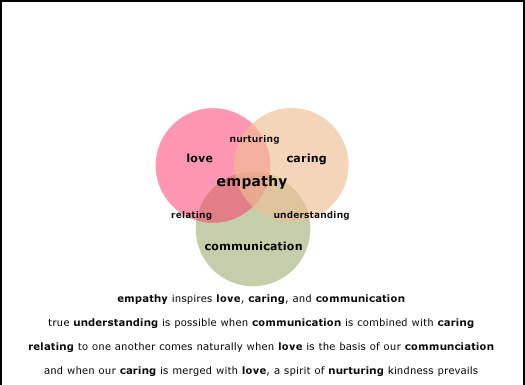 Empathy gives you lots of useful information, like what’s most important to others or what’s really bothering them. This week, repeatedly tune into the interior of the people around you; “empathy moments” often take just a few seconds. To help yourself, remember that empathy is not agreement or approval. You can tune into someone who hurt you or is irritating; you’re not waiving your rights! Nor do you have to solve the other person’s problem. Also know that empathy is completely natural. As we evolved, the brain developed three circuits (loosely defined) for empathy that simulate the actions, emotions, and thoughts of others. For example, when you experience an emotion, a part of your brain called the insula lights up; remarkably, when you see emotions in others, some of the same neurons in your insula activate as well. The result is you get a taste of what they’re feeling. You were born empathic. Start by centering yourself so you don’t feel overwhelmed; studies have found that, paradoxically, a little feeling of detachment actually promotes empathy; as Robert Frost wrote, fences make for good neighbors. Then open up to other people, letting their inner life flow through you like wind through the leaves of a deeply rooted tree. Tune into their breathing, posture, gestures, actions. Imagine what it would feel like to move your own body in the same ways. Tune into their emotions, particularly the softer ones underneath verbal positions or anger. Watch the eyes closely; human eyes are the most expressive of any species on our planet. Open up to your own gut feelings, which could be resonating with those of other people. Ask yourself what you would be feeling if you were them. Tune into their thoughts, memories, expectations, needs, and intentions. Form little hypotheses in your mind about what could be going on over there. Take into account what you know about their personal history – including with you – and their temperament, priorities, hot buttons. Be curious and look beneath the surface. As appropriate, check out your empathic intuitions. Ask simple questions, like: Were you feeling ____ ? Did you want ____ ? Did you feel pulled between ____ and ____ ? Be respectful, not persuasive or prosecutorial. Don’t muddle empathy with asserting your own views or needs; do that part later. Stay with it. Empathy is a kind of mindfulness practice, sustaining attention this time to someone else’s inner world. And when it’s your turn to receive empathy, you’ll know better what it is you are asking for. The best way to get empathy is to give it.